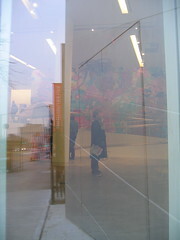 The last time I made the trek (which really isn’t so long) to the Bronx Museum was for their hip-hop art show in 2002. Since then they’ve added a new building and greatly expanded their gallery space. O. and I went up for the last day of the “Tropicalia: A Revolution in Brazilian Culture” show last weekend. I had read about Tropicalia in school, count myself along the legions of Os Mutantes fans and got to see Caetano Veloso play at Carnegie Hall a few years ago. What was great to understand was the visual culture that was going on at that time. It was such a strange time- the culture so detatched from the government, but also very much rebelling against it. It’s very 60’s- self-absorbed and visionary, resistant and complacent at the same time. Perhaps we could say that about many cultural movements. Another great thing about going to the Bronx Museum was when I annoucned I work at another “outer bouroughs” Museum (in order to get free admission) the staff member told me heartily “Welcome to the Bronx Museum!” Outerborough Museum Solidarity! This entry was posted in Art and tagged Uncategorized. Bookmark the permalink. What did you think of the Bronx Museum program? I was disappointed. The mural designed for the event was delightful but the large room with the paraphernalia for various interactions with the artists just wasn’t very meaningful. The posters and clothing in the room I liked. I felt there should have been music playing everywhere, not just on one tiny video.